I consider myself a classical musician, and there’s nothing better to me than playing bass lines in Beethoven Symphonies and Strauss Tone Poems. I also consider myself greatly intimidated by new music simply because I don’t have much experience playing it. Fast forward to the Civic Composers Project which began in March, and I’m thrown outside of my Beethoven comfort zone and challenged to interpret musical notation and ideas I’ve never seen before. After working collaboratively with each composer in a 6-hour workshop, I was no longer intimidated by this new (to me) music. The composers were more than happy to examine specific techniques or phrases in each piece to help us gain a greater understanding of their art. My favorite moment was getting to drag a super ball on a stick across the body of my bass to produce a descending sound that mimicked that of a whale call. I would never get to do that in Beethoven’s music! I am grateful for being able to expand my comfort zone by working in this project. The Civic Composers Project provides a unique opportunity for worlds to collide, collaborate, and produce exciting new works of art. Composers and orchestral musicians don’t always relate to each other easily. Lots of well-documented factors negatively affect the amount and quality of work that we do together; orchestras are frequently reluctant to program new music, players can be derisive towards it, and limited rehearsal time, union rules, and more combine to create an environment that can turn off composers. For our part, composers often develop a hostile attitude toward writing for orchestra, distrusting the potential for innovation among even the most forward-looking orchestras, conductors, and players. Here in Chicago, though, where there is a vibrant scene of composers writing primarily chamber music for many of the best new music ensembles in the nation, the Civic Orchestra, CSO Mead Composers-In-Residence Samuel Adams and Elizabeth Ogonek, Eighth Blackbird, and conductor Michael Lewanski of Ensemble Dal Niente are coming together to bridge the collaborative divide between the new generation of composers and orchestral musicians. It was clear from the beginning of the first day of the Civic Orchestra Composers Project that something special was happening. Pierce Gradone’s Ruckus, a conducted large-ensemble piece anchored by a complex groove, was sounding amazing, especially after Gradone suggested that the musicians try to feel a silent backbeat that governed the placement of syncopated rhythms. This is a conversation that often goes really poorly in orchestral situations, with eye-rolling among musicians and ensuing performances that stagger lamely and never even come close to finding a pocket. The conventional wisdom is that orchestras don’t groove, but this one did. They were focused and engaged, suggesting ideas and responding avidly to Lewanski’s conducting, and they showed the same enthusiasm and ownership through rehearsals of smaller, unconducted chamber works by Jongblum Lee and Roger Zare, both challenging in entirely different ways. But it was when they got to Marta Tiesenga’s piece, Snaefellsnes, a gorgeously-drawn graphic score with pages of instructions, nature-inspired poetic images, and heavy reliance on musicians to be independent and listen to each other, that I was really blown away. The twenty-two players sat in a large circle with the composer listening in the middle, participated in extensive dialogue with her and each other about how to best realize the illustrations, and played with such acute intensity and sincerity that everyone else in the room was silent, still, and captivated. My solo piece for violin and electronics, fly, into the light…, received the same care; violinist Janis Sakai was meticulously prepared, performed with beautiful depth of tone and feeling, and was endlessly patient as we tried different things. What was even more amazing, though, was that it was rehearsed at the end of a six hour day (! ), and all of the musicians, composers, and facilitators were still there, listening with interest and not seeming to want to be anywhere else. And, like the players, we composers broke the stereotypical patterns. We branched out and got to know others at lunch, rather than creating a “composer table.” We spoke sincerely and unaffectedly about ourselves and our music to the group, and we were really appreciative of each other’s very diverse work. I’ve actually missed everyone since that first day; I’m really looking forward to our remaining rehearsal and concert time and to productive ongoing relationships with new friends. From the backbeat to a vision for a friendlier future of musical collaboration, we’re all feeling it. As classical musicians, we spend much of our lives working to understand what sounds a composer with whom we cannot directly confer would want us to create on his or her behalf. We seek out teachers who will not only lead us toward proficiency on our instruments but also–I would say more importantly–guide us into an ever more clear and nuanced understanding of the musical gestures individual composers imagine, as well as the idiosyncratic ways in which they notate those ideas. Recently I played in a master class given by the composer and conductor Esa-Pekka Salonen, and as he coached another group in a performance of his string quartet, he told them, “When I write lines under the notes, I mean for them to be completely connected.” I scribbled that on the back of my score for later digestion. Lines under notes can mean almost anything, depending on context and composer: slight accentuation, full value but slightly detached, completely connected; a musician has to know each composer’s individual language and system of code inside and out. Long after “Every Good Boy Does Fine,” we are daily engaged in learning to more precisely and accurately read music. Now consider contemporary music. Composers today imagine not just configurations of notes that they never have heard before, but at times sounds themselves–scratches, whispers, grunts–that they may never have heard, at least as produced by orchestral instruments. Many of us have never heard them, either, and almost certainly our understanding of how to read or write those sounds lags considerably behind our understanding of how to read Beethoven. The process, then, of learning a brand new piece of music differs considerably from the process of learning a Beethoven sonata. This spring, through the Civic Orchestra Composers Project, members of the Civic Orchestra have the opportunity to explore that process as we learn works by composers who are about our age and live in (to varying degrees) our own neighborhoods–Lincoln Square, Chicago, the Midwest. Some of the works look basically the same on the page as scores to which we are all accustomed, with staff, clef, rhythms, pitches, and dynamics. Others use less familiar symbols to dictate more recently developed techniques, such as transverse bowing, in which the bow moves perpendicular to its usual path, toward and away from the player’s face; or dragging a rubber ball along the wood of the instrument to produce what I would call a sort of deep-throated squeak. One score, inspired by the landscape of Iceland, contains not staff and notes but unfamiliar symbols that signify various techniques and convene on the page to form what looks rather like a map of Middle Earth. Through workshops and rehearsals, we have had the rare and wonderful opportunity to collaborate directly with the composers in experimenting with different ways to execute the sounds and concepts they imagine. Throughout the project, we have also had the privilege of being guided by the eminent contemporary music ensemble Eighth Blackbird. Last week, members of that ensemble coached Civic musicians on Pierce Gradone’s “Ruckus,” a piece that, on the spectrum of this project’s content, uses fairly conventional sounds and notation. We were struggling to lock in with each other in a particular passage, so our coaches told us to accentuate particular notes within the phrases–high points, essentially–that would make the shape of the phrase pop out to the listener and help us to rhythmically solidify our ensemble. Hesitation was expressed, as the composer did not write accents over those notes. “Yeah, but that’s what he wants,” our coaches replied. The composer wants the musicians to do whatever will make his or her imagined sounds, as communicated to us through symbols on a page, into actual sound. We played the passage again as they suggested, and finally we were able to hear each other clearly, play together, and, most importantly, bring the phrase to life. Having spent around twenty years together learning works on which the ink is barely dry, working side-by-side with composers, these musicians have developed an incredibly nuanced understanding of the sonic effects intended by given notations and the ways to most efficiently execute those effects. Through the Civic Orchestra Composers Project, we are getting a taste for ourselves of that process, its intricacies, and its rewards. Without wanting to make claims that are too grandiose, I nevertheless feel like we can observe certain historical trends on a microcosmic scale when it comes to US arts institutions. Because of an understandable state of financial anxiety surrounding the existence of, say, orchestras, there is an observable tendency towards specialization as a way of creating efficiency. Labor is divided to save time: some people are administrators, some people are stagehands, some people are violinists, some people are conductors, some people are composers. Everyone does their job and is trusted to do their job; they often do it in isolation, or with other people who specialize in the same thing. There are many advantages to such an institutional framework: processes are transparent, careers are protected, people can feel a sense of long-term security. But what is gained in efficiency is sometimes lost in excitement and authenticity, and, increasingly, we’ve seen this expressed in culture. 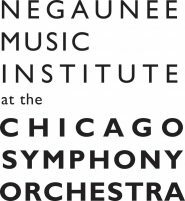 A particularly striking thing about Chicago in the last 10-15 years, say, is watching generations of up-and-coming musicians and composers, let’s say people my age (I’m 37) and (sometimes much) younger, think about this dialectic. I live partially in a world in which the metaphorical pendulum has swung very much in opposite direction of the division of labor. I work with small arts non-profits in which things are, frankly, much messier. A single person often wears multiple hats: administrator, programmer, musician, stagehand. This rather more Wild-West-ish approach has produced an amazing multiplicity of ensembles, compositions, performances practices, and styles—almost (actually, no: definitely) too much to be taken in by a single person. Sometimes the innovations are stunning, beautiful, heart-breaking, life-changing. Sometimes they are half-successful, a nice try, a good start. Sometimes they fall flat. Whomp. But what’s happening here with the Civic Orchestra musicians is different, actually very different. Musicians living and working in Chicago are interacting and creating art with composers who are living and working in Chicago. These are people who deal with this city in a variety of possible ways: they ride the el, have to deal with Cubs traffic/fans, lament the dark/cold/snowy winters, are irriated by constant construction, are upset by social injustice and economic equality, have an ambivalent relationship to their own privilege, drink Malort shots, enjoy the neighborhoody/urban combo that is this city. It is not possible to have a unified perspective on Chicago, but young musicians and composers here are creating a concert that reflects—obliquely and unobviously and circuitously—what it means to live here now. So what is interesting about this project is precisely its not-unified-ness; and this because that’s mostly what our experience of life in 2016 Chicago is like: (maybe thrillingly) ununified, chaotic, unpredictable. There’s a piece that’s a graphic instruction for a guided improvisation based on Icelandic geography; a piece about the moon’s phases; an engagement with an Eastern-philosophical concept of nature; a solo that’s meditation on a single chord; a work that’s about mirrors I-guess-sort-of but maybe isn’t about anything. And then there’s a piece whose title maybe describes the the overall vibe of the project: Pierce Gradone’s “Ruckus.” Gosh, I think it’s just so great.